During January 2012 the Baku Bears chose a matchday to help raise funds for the Erskine Hospital. A big thank you to all who contributed on the day helping the club raise 620 pounds for such a worthy cause. On behalf of all Erskine veterens families and staff I would like to thank you for your very generous donation of £620.00 which we recently received. It is marvelous that we can count on the support of people like you to continue our much needed work. It really is thanks to people like you that Erskine is able to provide such a high quality of care for the brave men and women who depend on us. DONATIONS ARE A VITAL PART OF OUR FUNDING- THEY PAY FOR EVERYTHING FROM LARGE ITEMS LIKE SPECIALISED MEDICAL EQUIPMENT AND ELECTRIC POSITIONING BEDS TO SMALLER THINGS like special cutlery that helps disabled veterans to eat without assistance. Gifts from supporters also enable Erskine to provide services like physio and speech therapy and to run the daily recreation programme that does so much to improve the quality of life for our residents. Over the past year or so the charity has also been looking at what kind of care and support younger ex-servicemen and women need from us. THIS HAS RESULTED IN THE DEVELOPMENT OF OUR SUPPORTED TRANSITION programme, helping the more vulnerable to make the change from Service life back into “civvy street” and the start of a horticultural therapy programme. 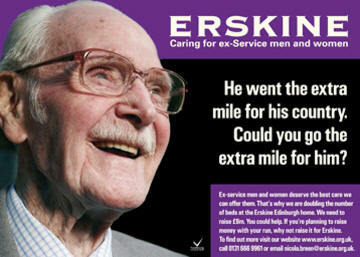 Whether our country’s service men and women are young or old, they turn to Erskine when they need help-and its your support that allows us to be there for them. So, thank you for your donation – it really is very much appreciated.